We breed only what we believe will make great service dogs. Prior to breeding we gather as much history as possible on each dog, including the health history, temperament, structure, soundness, coat and color, from all of the ancestors, parents, grandparents and so on. We begin with our breeding stock that is an excellent representation of the breed standard, a dog of health, soundness, structure and possess all of the outstanding breed characteristics known to the Australian Labradoodle. Through this careful screening process I feel that we have the advantage of selecting only the best mate for each dog we choose to breed. We never compromise the health, soundness, structure and temperament. The resulting litters are top quality allowing us the opportunity to select top quality future breeding stock from nearly every litter. Once we have decided to breed a specific dog we then analyze the resulting litter, adding this information to both parents charts. 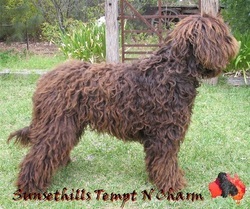 We are always working hard in moving forward to produce the best possible Australian Labradoodles.